These circuits consist of two independent, high gain, internally frequency compensated which were designed specifically to operate from a single power supply over a wide range of voltages. The low power supply drain is independent of the magnitude of the power supply voltage. Application areas include transducer amplifiers, dc gain blocks and all the conventional op-amp circuits which now can be more easily implemented in single power supply systems. For example, these circuits can be directly supplied with the standard +5V which is used in logic systems and will easily provide the required interface electronics without requiring any additional power supply. Inthe linear mode the input common-mode voltage range includes ground and the output voltage can also swing to ground, even though operated from only a single power supply voltage. LM358 LOW POWER DUAL OPERATIONAL AMPLIFIERS View Diodes Incorporated. 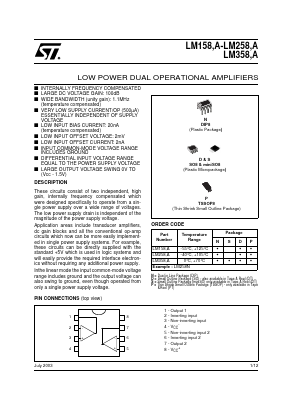 IL082 Low Power J-FET DUAL OPERATIONAL AMPLIFIERS View Integral Corp.